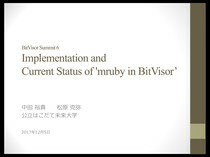 I will talk my experience of embedding mruby into a hypervisor ‘BitVisor’. BitVisor, that was made in Japan, is an open-source thin hypervisor especially for instrumenting and rewriting device I/Os such as network, USB, and HDDs. It has been quite hard to implement it although mruby is suitable for embed. In Bitvisor, almost standard library functions cannot be used and the FPU processing is restricted since hypervisor must be running under OS. I wish my unique experience could be useful and valuable not only for users but also for mruby contributors.